New Zealands are gravitating towards cities and expecting compact, functional spaces. This means that architects are under increasing pressure to create spaces, which do more, with less. Architects need to be on top of new technology, trends and desires to keep up with the changing New Zealand residential landscape. Specifying an appropriate hot water system can unlock extra space; reduce energy use and the ongoing cost to residents. This whitepaper unpacks the benefits of decentralised hot water systems for multi-residential developments. Ideally, the hot water system of a building is considered early in the design process, particularly when space is a premium. The configuration and limited space of multi-residential buildings means that there are fewer options for fitting hot water systems. The right system for the development will depend on the available space in apartments and common areas, typical outdoor temperature ranges, the additional electrical load, water restrictions, costs, the number of apartments and average consumption. The two main types of water heaters are storage systems and continuous flow (or instantaneous) systems, which are heated by gas or electricity. Gas is less efficient than electricity as it has a lower heating efficiency of around 85% compared to 99%. Centralised hot water systems are increasingly going out of favour due to their running costs and the environmental impact. A major drawback of these systems is the energy needed to keep a large system consistently at the desired temperature, even when the water is not in use and the amount of heat, which is lost transporting the water from the storage system to the point of use. The matter of who pays for the lost heat and the energy used to heat the water can get tricky. In the instance of a central system with a hot water meter, the cost of heating water is determined via a calculation that measures water usage to determine the dwelling's gas consumption. The equation used to calculate the gas and water bill is not transparent. Electric instantaneous water heaters are the only true user-pays option and are being used more in apartments. The water is only heated when it is required, eliminating water and energy wastage and ensuring bills are accurate. The changing New Zealand residential landscape and consumer demand are major factors in the decisions made by developers, architects and service engineers regarding water-heating systems. ABS statistics show that approximately two-thirds of New Zealand's population lived in a Greater Capital City at June 2015. These already highly populated cities are showing no signs of slowing down, with the most prominent population growth inside capital cities. To maintain a comfortable lifestyle, residents will need to be provided with the maximum space available in their living environments. Traditional central water systems are bulky and can take away valuable communal spaces. A compact decentralised system can free up space on the building's roof or underground area for amenities, as they are small in size and can be installed in the apartment close to where the water will be used. Consumer demand and preference plays a central role in the design process. A rapid growth in public awareness of climate change and the need to reduce greenhouse gas emissions is driving a desire for sustainable buildings. Choosing and installing the most appropriate and efficient water heating system can greatly reduce a building's environmental footprint. Water heating accounts for about 21% of the energy used and generates about 23% of the greenhouse gas emissions from an average New Zealand home. 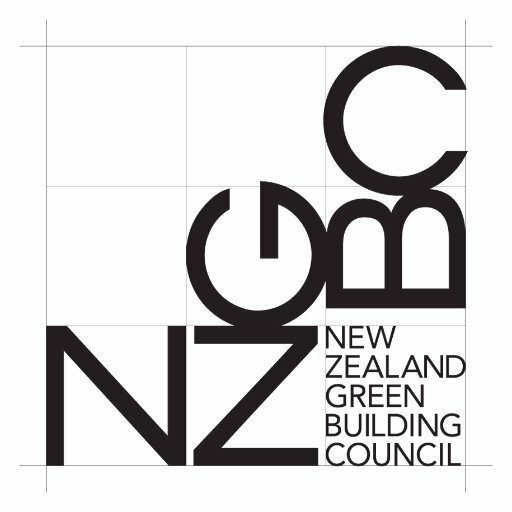 It is the largest source of greenhouse gas emissions and the second largest segment of household energy use in New Zealand, after space heating and cooling. An appropriate system will allow residents to save money and potentially reduce greenhouse gas emissions without compromising their lifestyle. Renewable energy is the linchpin in the path towards sustainability. The International Energy Agency expects electricity generation from renewable energy sources to increase from 21% in 2012 to 33% by 2040. It is reasonable to assume that today's design will last around 20 years before any renovations will occur and during that time, the technology surrounding renewable energy is likely to advance dramatically. Architects can help ensure their design continues to serve its users by incorporating systems, which can be powered by renewable energy. Consumers not only want to know that their living spaces are sustainably designed, they want to be able to keep track of what energy they use and pay for. Knowing how their behaviour translates into energy usage can present them with information to base energy-saving decisions on, such as taking shorter showers. Some instantaneous hot water heaters feature a digital display, which shows energy, water and CO2 savings. Further innovations in the works include Bluetooth controllers with even more details and eco-friendly options. Compact, decentralised water heaters are increasingly being chosen for modular designs over bulky, centralised alternatives. Modular design, or 'prefabrication', refers to any part of a building that has been assembled offsite often sees whole sections of a building essentially unpacked and secured on site. It dramatically speeds up construction time, lowers material costs and increases quality assurance. One of the tallest towers to grace the Melbourne CBD, the 69 level tower of 568 Collins St used this construction method. All 794 bathrooms were manufactured offsite, complete with tiling, joinery, finishes and fittings. Bathrooms were simply craned into site, positioned on the level entry slab and connected to services. This reduced fit out cycles by up to 20% and greatly reduced the amount of waste produced and handled on site. Decentralised water heaters are chosen for modular designs such as 568 Collins St as they simplify the construction process. They provide each pod with a complete water heating solution. Another driver of the movement towards decentralised hot water systems is the eliminated risk of legionella. The presence of the potentially deadly bacterial disease can render water systems out of action for days, placing a massive inconvenience on the building's occupants. Legionella can grow in centralised hot water systems that are faulty or have not been thoroughly cleaned. In 2015, 98 cases of legionnaires were reported in NSW alone. Late last year, the news was released that a legionella risk in the warm-water system of North Melbourne's George apartments was left unattended for months. When a centralised water system is installed, it is left up to the owners' corporation to maintain the system and manage the risk of a legionella infection. An instantaneous unit eliminates the need to rely on the owners' corporation to manage legionella risk as they do not provide the conditions in which the bacteria thrive. They also abolish maintenance issues such as cleaning filters. Once the instantaneous unit is installed, its occupants have peace of mind. 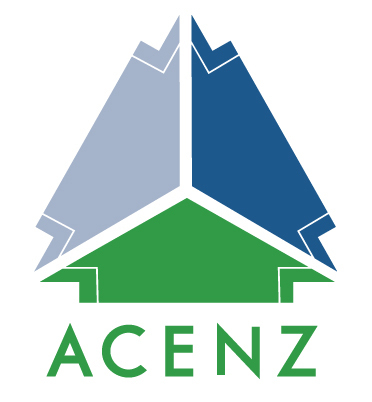 Decentralised water heating systems are an ideal solution to many challenges posed by multi-residential buildings in New Zealand. They simplify and streamline the process during construction as the hot water systems are installed in each individual residence, making it possible to carry out a staged handover. An instantaneous electric hot water solution can be positioned where it is needed without the restrictions associated with gas feeds, flues or venting, simplifying the construction process. Also, less plumbing is needed between the heater and where the water is used due to its placement within a residence, reducing labour costs and making their installation more cost-effective. The use and demands put on a hot water system can be difficult to estimate and often the hot water usage is even less than the electrical standards and the plumbing code estimates. Recorded data shows that the increase per dwelling is from as little as none to a maximum of one kilowatt in the kilowatt per dwelling outcomes when comparing instant, decentralised water systems to a central gas system. Instantaneous water systems can help accommodate a variance in usage as they only heat up the water when it is needed, rather than storing large amounts in anticipation of predicted usage, and they will never run out of hot water. STIEBEL ELTRON supplies a range of cost-effective instant hot water systems, which have been used in projects across New Zealand and the world. Melbourne's Central South Yarra incorporated STIEBEL's products into 30-levels of modern living. The design maximised spaces and packs in one and two-bedroom apartments and luxury penthouses, along with a resident's rooftop retreat with landscaped outdoor sky terrace, gym, a heated pool and communal entertaining areas. It utilised the Sync Building System for the bathrooms, delivering higher grade finishes at no extra cost to the developer and was handed over six weeks early. Vogue South Yarra is a mixed development of retail outlets and 498 residential apartments. 502 STIEBEL ELTRON instantaneous water heaters (DEL 18 AU and DEL 27 AU) were installed in the project, allowing it to be completed on time and on budget. Alistair Guss, Director of MacCormack Associates Consultants, the engineering consultants for the Vogue South Yarra project, said the work was kept to schedule because the offices and apartments could be completed in stages. �"During construction of the podium levels and tower, groups of apartments were completed and handed over to their owners. This allowed the plumber to work to the builder's schedule on an apartment by apartment, level by level basis," he said. �"If we had a centralised system we would have had the equipment fully plumbed and water circulating through floors that were still under construction." In the ACT, the development Victory Homes in Canberra was given instant hot water on demand by installing 120 premium DHE 27 AU instantaneous electric water heaters, and the apartment building Riverlight Settlers Cove in Noosa, Queensland, used 44 units of the same water heater. The famous 1 William Street in Brisbane utilised 138 DHE water heaters, Quest Apartment Hotels in West Perth is fitted with 52 DELs and Adelaide's UV Apartments with 78 DHB-E 18 instantaneous three-phase electric water heaters. 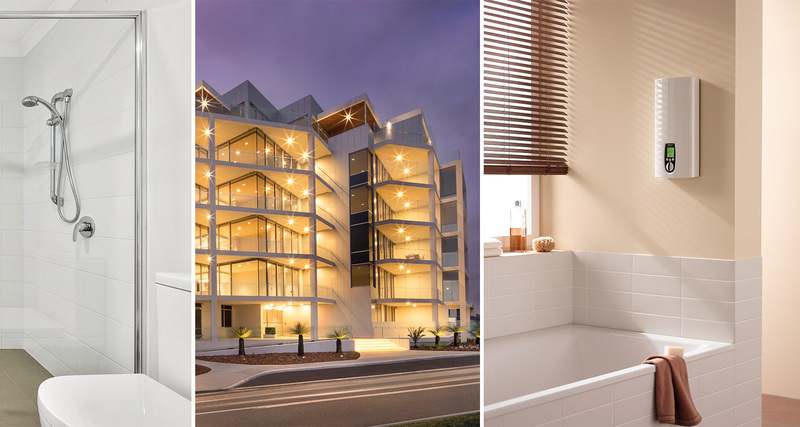 STIEBEL has also been involved with Sundance Apartments, Scarborough; Empire Apartment Hotel, Rockhampton; Pacific Sands Hotel, Mackay; YMCA Day Care, Nerang; Paragon Apartments, Perth and many more projects. STIEBEL ELTRON's range includes 3 phase instantaneous water heaters suitable for multiple outlets. The heaters provide an instantaneous hot water supply ensuring that residents never run out of hot water. The heaters are designed to be installed as close as possible to the most used hot water outlet, which can help to save water, energy and money. They are up to 30 percent more water and energy efficient compared to older style hydraulically controlled instantaneous water heaters. The water heaters are compact, ranging from 370mm x 220mm x 130mm in size to 478mm x 225mm x 105mm and are ideal for installations where space is a premium. As they do not require ventilation, relief drain or safe trays, they can be installed in areas such as a cupboard or roof space. STIEBEL ELTRON is a world-leading manufacturer of water heating, renewable energy and home comfort solutions. STIEBEL ELTRON's history dates back to a small backyard workshop in Berlin, where Dr Theodor STIEBEL developed the first water ring-type immersion heater in 1924. STIEBEL ELTRON New Zealand commenced operations in Melbourne in 1996 and quickly expanded to Sydney, Perth, Brisbane and Adelaide. In May 2014, STIEBEL ELTRON celebrated its 90th birthday and 2016 marks 40 years of the company's development of renewable energies. STIEBEL ELTRON has sold over 22 million electric instantaneous water heaters during its rich history and the company is known for its innovation and development of efficient products that save both water and energy. If you have any questions regarding decentralised hot water or instantaneous electric hot water, contact us on 09 486 2221.